Vintage-inspired designs with a rock-and-roll twist. Singer and songwriter Sheryl Crow brings her unique mix of country and rock and roll to her stylish clothing line. If you're looking for everyday pieces with a touch of the unexpected, turn to the Sheryl Crow line. Whether you're simply running errands or you're heading out for an afternoon with friends, Sheryl Crow makes it easy to create the ideal outfit. Start with one of her comfortable tops with unique details, such as lace trim, fringe, or embroidery. Match this shirt with a pair of relaxed jeans, and keep the laid-back vibe going by choosing a pair of sandals to complete the look. For accessories, layer some chain necklaces and slide on a few bangle bracelets. Sheryl Crow also offers a nice selection of leather handbags. 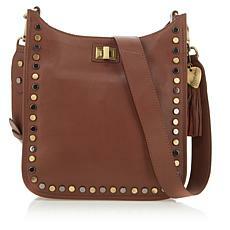 On the outside, these handbags have eye-catching details like studs and woven fabric. The insides are spacious enough to hold all your essentials, and they come with pockets to corral those small items. They're also stylish enough to go with everything from laid-back jeans to a professional skirt. When you're looking to add the relaxed and easy-to-wear style offered by Sheryl Crow, be sure to shop at HSN for all the latest looks.